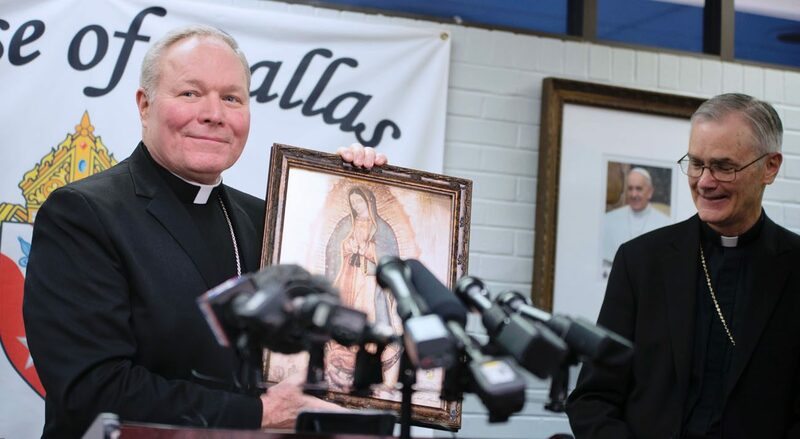 DALLAS (CNS) — Bishop Edward J. Burns met with staff at the Catholic pastoral center in Dallas the morning of Dec. 13, asking for their prayers, telling them that he had already been praying for them and saying that he looked forward to working with them and others doing God’s work. Head of the Diocese of Juneau, Alaska, since 2009, Bishop Burns, 59, was named that day by Pope Francis to be the next bishop of the Diocese of Dallas, succeeding Cardinal Kevin J. Farrell, who is now the prefect of the new Vatican office for the laity, family and life. “I do see a joy in their faces as they serve,” Bishop Burns said of diocesan staff at a news conference later in the day. He will be installed as the eighth bishop of Dallas Feb. 9 at the Cathedral Shrine of the Virgin of Guadalupe in Dallas. At the news conference, he also talked about his years of service to the church and talked about the importance of priests, women religious, deacons, seminarians, the laity and the parishioners in the pews to the life of the church. Acknowledging and apologizing that he did not speak Spanish in a diocese where many of the 1.3 million Catholics are of Hispanic origin, he said he would learn it quickly. He also said that he would remind immigrants that the church is in solidarity with them and said that he looked forward to celebrating Mass at the Cathedral Shrine of the Virgin of Guadalupe during the feast day next Dec. 12. Bishop Burns called himself a prayerful man and said that at first glance it may seem that coming from a small diocese would present a challenge in administering one of the fastest-growing dioceses in the country. The 37,600-square-mile Diocese of Juneau is considered one of the U.S. church’s home mission dioceses. Out of a total population of 75,000, it has 10,000 Catholics and has one Catholic school. By contrast, the nine-county Dallas Diocese is home to more than 70 parishes, many whose congregation swells beyond 10,000, and it has approximately 15,000 students in diocesan and private Catholic schools. The Dallas Diocese also is home to numerous Fortune 500 companies, including AT&T, Exxon-Mobil, Toyota of America, among other regional conglomerates. The diocese, under then-Bishop Farrell’s leadership, recently completed a $125 million capital campaign and has consolidated four diocesan elementary schools into academies and seen the renovation of numerous parishes and schools. Bishop Burns said he spoke to Cardinal Farrell recently by telephone. He said that he hoped to build upon the great work of then-Bishop Farrell over his nearly 10 years as the leader of the Diocese of Dallas and that he would begin by visiting parishes and schools throughout the diocese in order to hear from others about the challenges that remain for the Dallas diocese. “I had a chance to thank him for the good work he has done in this wonderful diocese,” Bishop Burns said. “I am personally aware of his generous service, not only to his local church, but also the national church and now to the universal church. Then-Msgr. Burns was named bishop of Juneau by Pope Benedict XVI Jan. 19, 2009, and ordained a bishop March 3, 2009, at St. Paul Cathedral in Pittsburgh, his home diocese. His installation was April 2, 2009. He is a former rector of St. Paul’s Seminary in Pittsburgh and former director of the U.S. bishops’ national offices dealing with clergy, vocations and priestly formation. Sedeno is editor of The Texas Catholic, newspaper of the Diocese of Dallas.